This dress has much fame which I did not know about when I commenced this project, I just though it was unusual and pretty and I love the way the straight skirt and full skirt are all part of one dress the goes over the head and wraps around the waist. A few years ago I went to Ceilidh event in Scotland and we were instructed to dress in tartan. Not owning anything appropriate and wanting something that would benice to dance in. 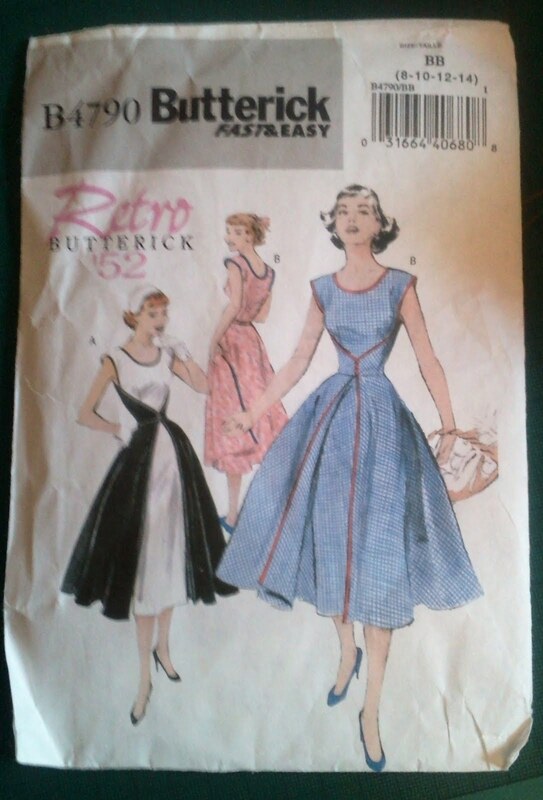 I chose this Butterick pattern because I wanted a vintage style dress with a skirt that would twirl beautifully. I liked the underskirt of this dress design thinking it might protect my modesty if the skirt twirled too high and as it doesn't have a seam at the back it doesn't restrict movement. a) the waist curves round and fastens exactly on my waist and there's a good 11 inches between that and my hips (I am hourglass) so its securely held in place. 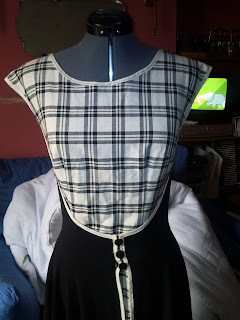 Also I am only using a button and loop on the back so its not too tight around the hips which would cause it to rise up. The under-dress fits me like a glove actually, I'm thinking of converting it into a dress of its own. b) the front and bust darts are in line with my apex - a fluke due to being low-busted - and my full bust fills the bodice with no FBA done. I can see why that would be a problem for someone who is small busted, masses amount of extra fabric. The problem I have with the bodice is above my bust there is excess fabric but that is a very simple fix, I just shorten it at the shoulder seams and voila, perfect fit. The issues I had were: While the underskirt fitted perfectly, the waistline of the full skirt appears to be slightly lower (shoulder seams fine). This meant that when it is wrapped round front it is too low and awkward and the gathering at the waistband added a lot of unflattering bulk at my hips. 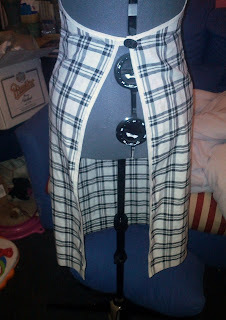 To resolve this I pull the full skirt part up a bit but then that causes the armholes to gape. 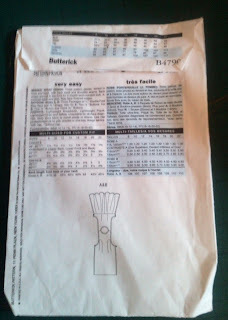 This was already a slight problem because of the extra length in the bodice and the pattern might benefit from the bust darts being angled down from the lower armhole instead of where they are. I had fabric related issues too. The weight of the crepe pulled the dress apart at the bias tape and the hooks and eyes on the front so I have to repair the bias tape trim and find a different fastening (I originally intended to do buttons and loops but ran out of time so probably will do that with black elastic loops and an inner ribbon for support). In summary, if I remade the dress I would extend the front panel where it meets a little to prevent this strain and then trim it back as necessary and instead of bias tape loops I would use elastic to make loops. I would extend the sides of the underskirt to provide more coverage at the back and if necessary add horsehair braid to the hem to keep it down and wrapped round. 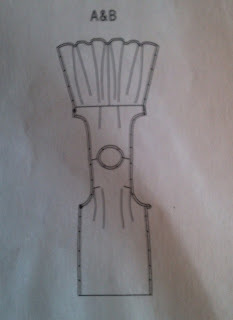 I would also move the bust dart to the armhole and shorten the bodice at the shoulder seams. Than you Renay, I'm glad you like it! As a fabric combination it works really well, but if I do make it again I'd like to try it in cotton and see what thats like. There are some really lovely versions around, a lovely blue print and red at the wiki page for 6015 and here is a gorgeous print one. Is it one that's in your collection too? I will be referring back to your post as I try and make my own. I am following your blog and hope to have time to go back and read all the great stuff I missed! Also how do you add a post to sew retro? I have a scan of a vintage hat pattern, but I don't know the number or the company. I was hoping someone could help me ID it. Anyhoo (sorry for the LONG comment) just happy to correspond with another vintage gal! I've read that this is a quick and simple dress to make. Would you say a pattern novice would be able to follow? 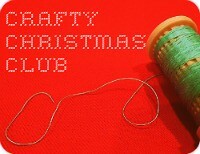 Katrina is doing a sew-along with tutorials on how to adapt the pattern for a better fit, make a crinoline, etc, etc. She's posted several times about it so far but her dresses look great! It was a very simple pattern to put together, although not a perfect fit. I think the worst part was hemming the skirts (there is yards of fabric) and attaching the bias binding. I'd really recommend using a lightweight, forgiving fabric the first time as I used a heavy jersey and battled with the weight pulling off my bias binding! It was originally promoted as a dress you could start making after breakfast and wear out to lunch that day. I think this is only realistic if you breakfast at 4am! But its only 4 or 5 pattern pieces so that speeds stuff up. 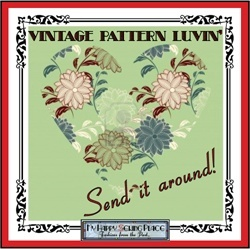 Hope it works for you if you decide to follow Katrina's sew-along! And yes, I do love a good ceilidh, especially in a swirly skirt! Love it! And I love that you wore it to a ceilidh too ;) I have this pattern in my collection but have yet to try it out. I can't decide what fabric patterns to do. But I really like your combination. 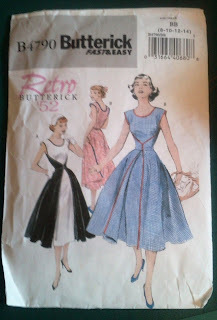 Thank you Christine, I'm actually altering the pattern at the moment to remake it, this time in polka dots! 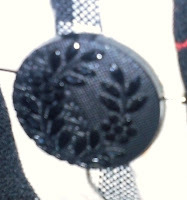 I was inspired by Katrina at Edelweiss Patterns recent sew-along to make it again. 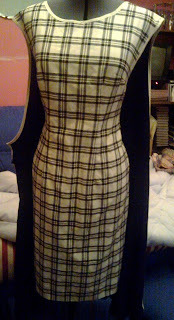 I've actually made a start to making the dress. 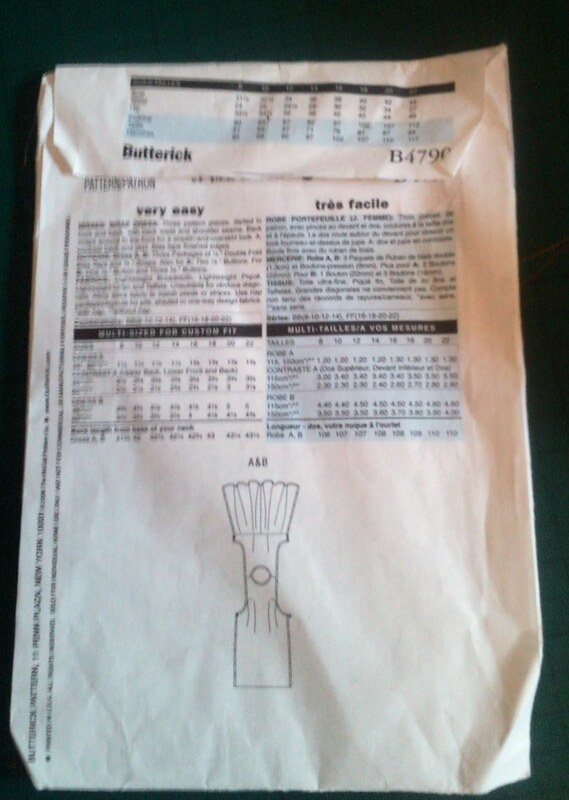 I think we must be similar build as I have the thing with the bodice above the bust being a bit loose. 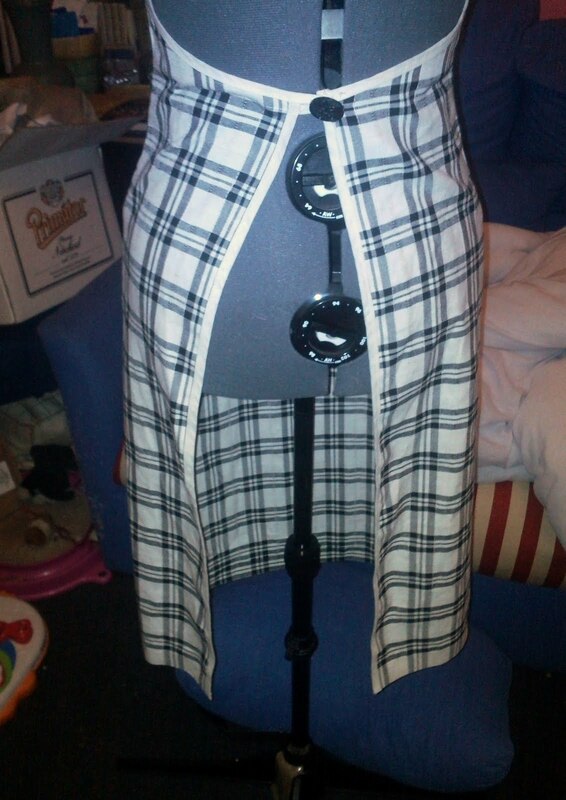 I'm thinking of doing button rather than snaps for the back fastening and hook & eye for front fastening. The swirly skirt - thinking of using that part of the patter to make a separate skirt. Did you ever make the underdress bit into a separate dress? Your dress is really coming along, I've copied the pattern but I'm still contemplating adjustments and other minor details, its been superseded by other projects and work. 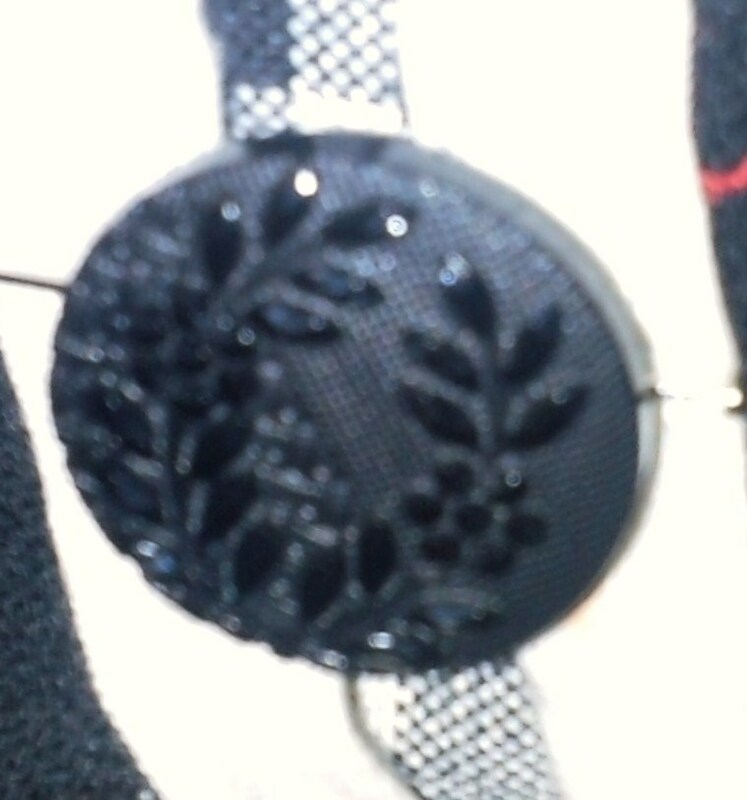 I have a button at the back of mine, I think it is a better option under strain of wear. I would recommend a trouser/skirt style hook and bar or clasp on the front as I found the hooks and eyes struggled to stay closed - in this case they strained at the fabric causing fabric fray, but too loose and they'd be coming undone through lack of tension! Not yet made the underdress into a pattern, thought I'd see how the remake of the full garment goes first before trying that. The swirly part is basically a circle skirt so could indeed be used on its on with the addition of a waistband. Look forward to seeing your finished dress!